This type of casting does not make use of any standard library function.In this method to cast a value simply assign one data type value to another type.For instance if you want to convert float type to int type you can simply assign the float variable to int variable.Another way to convert float to int type is to mentioned the type to which the variable is converted to before the variable name.Look at the code below. 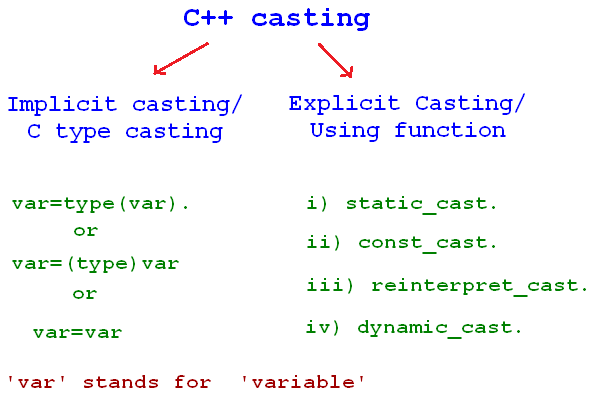 The three methods of casting employed above are known as implicit casting.The two methods in which we mentioned the type to which the data is to be converted is known as C type casting,because it is originally part of C language. When to use each of these functions and what are their differences will be discussed thoroughly in Chapter 2. The implicit and explicit casting method is shown briefly below. Why casting is not a safe method? When ‘long long’ variable ‘ll’ whose size is 8 bytes,is converted to int type whose size is 4 bytes it results in some loss of information.This is due to the difference in the size of the two data types. However in some cases,even when the data type size are the same and casting is performed some values is still lost.Say converting float to int type (as shown in the Implicit casting type example above) the fractional part is lost hence the value losses it’s accuracy utterly.Due to this reason and another reason explained in Chapter 8 casting must be avoided as much as possible. ← C++ more types :Void , bool, decimal, octal, hexadecimal, etc. Some terms : Variables , Identifier , initialization , assignment, Keyword , Operators ,literals.